Welcome to the TerraLex Corporate Counsel Value Kit. We recognize that the challenges that are faced by the in-house counsel community are unique and multifaceted. A key goal for our network of firms is to provide you with the resources necessary to effectively navigate the rapidly changing and evolving legal marketplace. As business needs grow globally, our network provides access to an expanded support system consisting of rigorously vetted law firms from strategically-resourced locations. 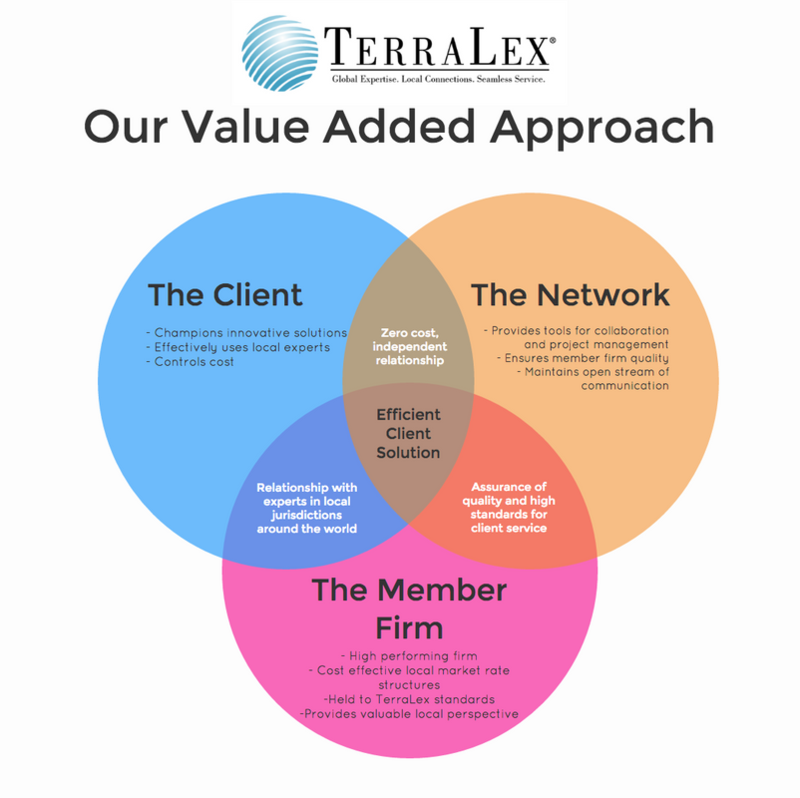 No matter how far and wide your needs grow, TerraLex firms are here to support you through our network of fully vetted local law firms in more than 100 countries. Below is a collection of tools and useful information to help you learn more about TerraLex and ensure access to strong, solutions driven legal advocates. Follow this link to be directed to ACC's Value Challenge Resource Page. We routinely conduct in-house counsel interviews with the goal of maintaining a deep understanding of the ever-changing legal marketplace and trends, so our members can develop effective and efficient solutions for clients with cross-border needs. Terri Pepper Gavulic, TerraLex’s Executive Director, is engaged in conducting these confidential interviews. We hope that you will consider being a part of this process by participating in a phone meeting with Terri. Even if you have limited input about TerraLex generally, your feedback on the changing market conditions impacting corporate legal operations will be very helpful. Take a minimal amount of time (generally 30 minutes, depending on how much feedback and input you have). Provide you with a periodic update of the overall emerging themes, innovations and challenges we are hearing across all of the in-house counsel we interview. If you would like to participate in this effort, click here to schedule your call with Terri. We have prepared a selection of tools that will be useful for in-house counsel searching for quality firms in a jurisdiction outside of their own. See below a selection of informative pieces, as well as our approach to managing engagements across multiple jurisdictions.